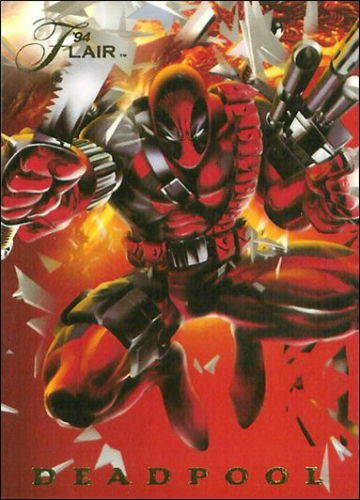 Deadpool, created by Rob Liefeld and Fabian Nicieza in 1991, is the quintessential antihero and has become one of Marvel’s most successful and beloved characters. First appearing in The New Mutants —issue #98 — as a supervillain, Deadpool evolved into the smart-mouthed, mercenary antihero that inspired one of the biggest superhero movies of all-time. In light of the popularity of the film, a surge in Deadpool collectibles has hit the market and this guide will help you sort out the best place to begin your collection. The origins of the Deadpool character are convoluted and confusing with many variations having been presented over the years, including one where Wade Wilson wasn’t even his real name. In spite of this, the appeal of the man with accelerated healing ability does not lie in his origin story, but, instead, in his personality. Aware that he is a comic book character, Deadpool often breaks the fourth wall and speaks directly to the reader which is where a great deal of the humor of the character is presented. Critics of the comic book character, as there are with virtually every panel of every comic ever produced, point to the similarities between Deadpool, a Marvel character, and Deathstroke, a DC character. This wasn’t an accident and was, in fact, embraced. Rob Liefeld was a known fan of Teen Titans — where Deathstroke appeared at the time — and the Deadpool team embraced the similarities by giving their character a virtually identical secret identity (Wade Wilson vs Slade Wilson), costume, weaponry, and fighting ability. Where the distinction is, though, is that Deathstroke hasn’t said a single funny line of dialog and Deadpool is humorous nearly all the time. In a bit of irony, Liefeld worked on the Deathstroke comic for DC’s New 52 rebranding in 2011. As is often the case with superhero pieces, collectors must sift through cheap marketing material aimed at children to find their high-end collectibles or those items that are most likely to yield a financial gain in the future. Despite the blockbuster film bearing his name having an R rating, Deadpool is no exception to this rule thanks, in part, to his association with the more kid-friendly X-Men franchise. The pieces worth collecting, though, are often comical and very true to the character himself. Review the key collectible options using the tabs above. In the grand scheme of comic history, Deadpool is a relative newcomer to the industry which makes his “vintage” comics pretty easy to come by since they were actually released during the heyday of comic excess in the 1990s. 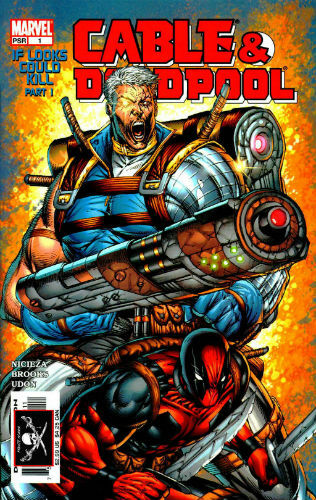 Rob Liefeld, the artistic half of the creation team, is quite possibly the most polarizing name in comic book history and the worst of his artwork has become a sub-genre of the collector market as well so keep an out for Liefeld covers, even on books that he didn’t draw. Shop for Deadpool Comics on eBay. Collectors should have no problem tracking down early appearances or debut issues of this Marvel character but graded issues have increased in value a great deal and non-graded issues in mint condition will typically run a few dollars above cover value. Some important areas to focus your collection on can be viewed below. It’s always good to start with the comics that bare the character's name. His comic debut won’t be found in any of these titles as Deadpool first debuted in The New Mutants #98 in 1991. Despite this, collectors will have a great chance at acquiring several different #1 issues as Deadpool has been cancelled and relaunched several times over the years. The original Deadpool comic, released in 1998, lasted for 69 issues and was followed by Cable & Deadpool which added another 50 issues. A second volume of Deadpool began in 2008 and ran for four years, releasing 63 regular issues as well as issues numbered 33.1, 49.1, 900, 1000, 2009, along with an Annual. Deadpool Volume 3 had a 45-issue release and Deadpool Volume 4 is the current series. 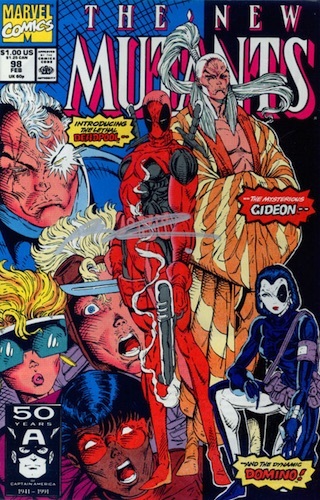 There were also short runs for Deadpool: Merc with a Mouth (13 issues) and Deadpool Team-Up which was numbered descending from 899, ultimately being canceled by issue 883. Beyond the main issues, there have been more than 20 Deadpool mini-series releases since 1993. 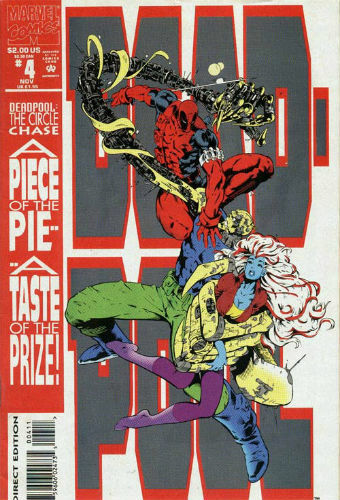 Deadpool: The Circle Chase was a four-issue series that introduced the character as a standalone comic entity. This was followed by Deadpool, another four-issue series that was the final series release predating the original Deadpool run. These issues are great to collect because of their limited series length, their availability, and the stories within the pages being exclusive to those issues. Deadpool: Circle Chase 1 NM SKUC25346 25% Off! X-FORCE 2 2ND DEADPOOL APPEARANCE 9.4 PGX SHIPPED IN BOX TO PROTECT! DEADPOOL #45 DEATH OF DEADPOOL WHAT THE DUCK VARIANT !!!! Deadpool, like many comic heroes, lends himself well to action figures and statues. With an arsenal of weapons, a cool costume, and top notch fighting ability, it’s no wonder that many likenesses have been made in Deadpool’s short history with more planned for release as his public popularity expands. Marvel Comics had been in charge of their action figure lines when they became part owners of ToyBiz in 1993. 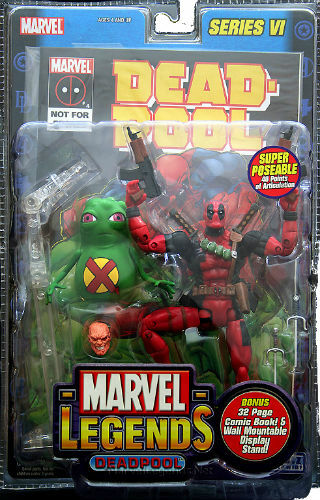 ToyBiz is now known as Marvel Toys but, based on Deadpool’s creation date, all of his action figure releases before 2007 can be found under the ToyBiz or Marvel Toys moniker, the first appearing in their 1992 X-Force line. In 2004, as part of their Marvel Legends line, Marvel Toys released a Deadpool figure in their sixth series that is considered one of the most collectible Marvel action figures on the market. Even out of the box, the loose contents regularly sell for $100 or more. In 2007, Hasbro became the sole provider of Marvel-related action figures, with Marvel Toys eventually shutting their doors after failed attempts to release action figures with non-Marvel trademarks. 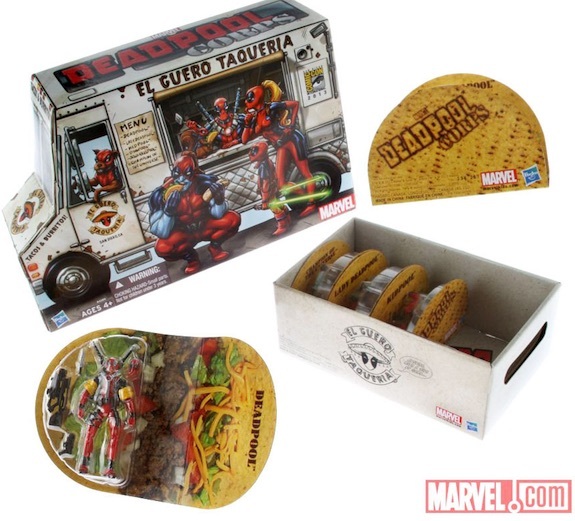 Hasbro has released mutiple Deadpool figures in several different configurations, including the 2013 SDCC exclusive Deadpool Corps Taco Truck which contained six figures, presented in taco shells and packed inside a taco truck carrying case. There are several manufacturers of Deadpool comic-based statues with a wide range of price points. 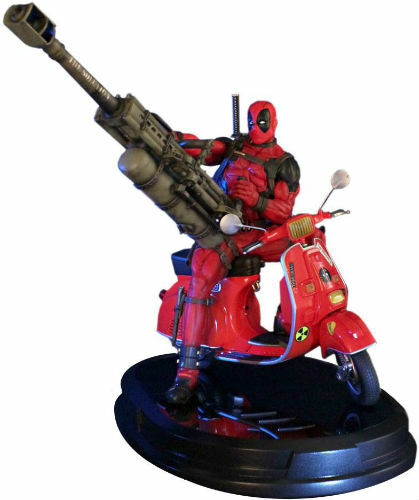 In 2012, Gentle Giant released a limited figure of Deadpool on a Vespa scooter which often sells for more than twice its original retail price of $369. Sideshow has given the mercenary their Premium Format treatment and that figure has topped out at over $1,000 while a piece released by Xionart has sold for over $1,800 in recent auctions. That’s not to say you have to drop the down payment of a car on one of these statues. There are statues produced by Kotobukiya under the Marvel Now brand that offer a much more reasonable price point for collectors simply looking for cool pieces to display. However, if you’re after high-end pieces that will mature in value, it’s going to cost quite a few bucks. Cheaper than all of these action figures and statues but not lacking in quality are the many offerings presented by Funko. Deadpool is represented in the main Funko’s Pop! Marvel line as well as their Wacky Wobblers, Dorbz, and Fabrikations lines. 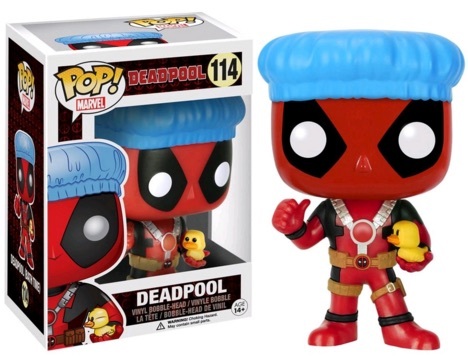 The Funko Pop Deadpool line includes several retail exclusives for collectors to track down, including a Hot Topic variation of Deadpool dressed like a pirate, a Target variation of bath time Deadpool, and an FYE Blue Deadpool alternative, among others. The alternatives number more than 25 with three different versions of his Chimichanga truck also available. For collectors looking for a fun figure to hunt down at various retail stores (or online, if you’re so inclined) that also looks good on a shelf, Funko Pop! is a great place to start. So far, there have been no trading cards exclusive to Deadpool. While the popularity of the movie may inspire a card set or two in the future, collectors can spend the meantime grabbing the dozens of Deadpool cards that appear in other Marvel sets. Shop for Deadpool Trading Cards on eBay. In 1992, Deadpool was included in the Uncanny X-Men set released by Impel and drawn by Jim Lee. 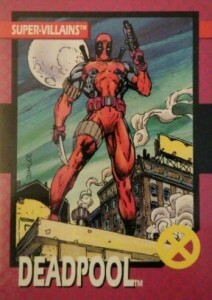 This is considered the Deadpool rookie card. Beyond cameos in base sets of many products released by Skybox and Fleer, Deadpool is included in several chase sets such as 1995’s Flair Holoblast and Fleer Ultra X-Men Hunters Stalkers, as well as sketch cards from 2014’s Upper Deck Marvel Premier. 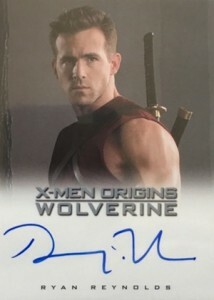 Ryan Reynolds, costumed as Wade Wilson, autographed approximately 300-500 cards for the X-Men Origins: Wolverine set released by Rittenhouse in 2009 that command large sums.